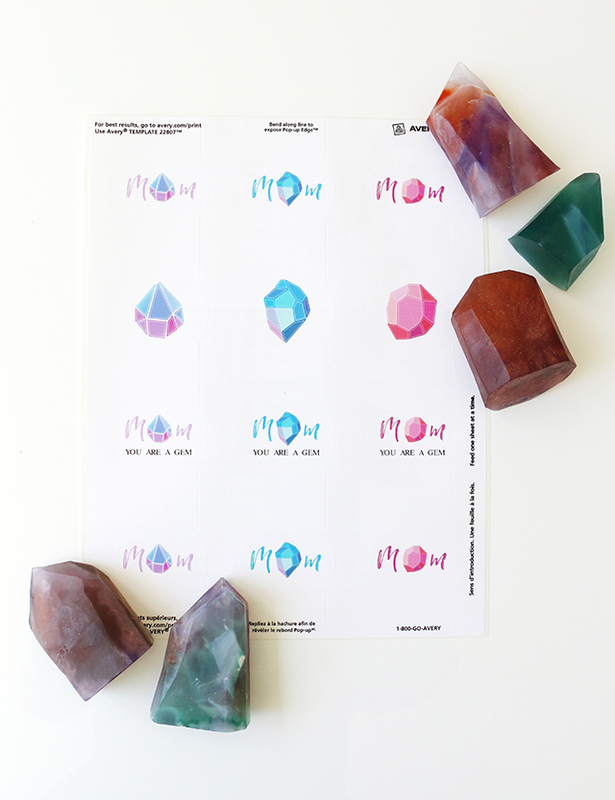 With Mother’s Day approaching in a few short weeks (May 8th), I’ve put together a fun DIY gift idea for the awesome mommas out there. 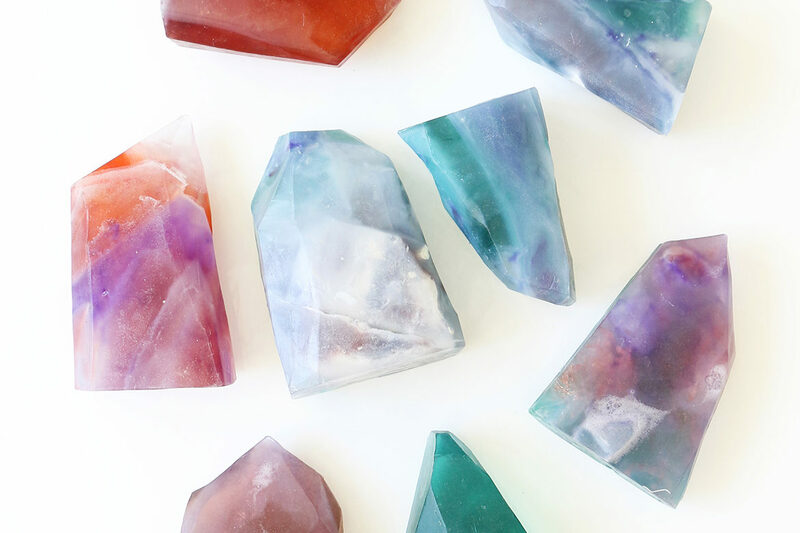 I had seen some very cool soap rocks at Anthro and a few other stores and fell in love with everything about them…except the cost. I wanted to see if I could make some myself for less, so that is what I did! 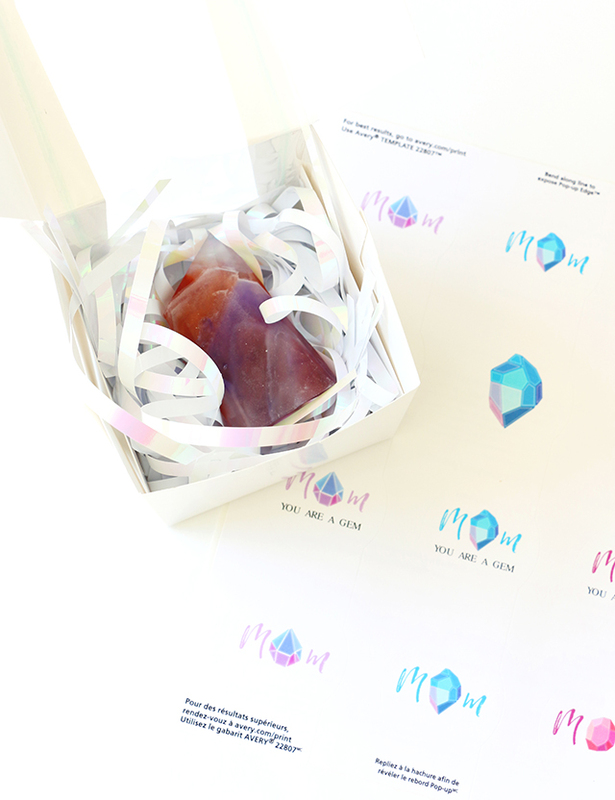 I partnered with Avery to provide you with free downloadable and customizable tags for the soap so that you can wrap and label these precious gems perfectly for your momma! Follow along below for the tutorial and printable. 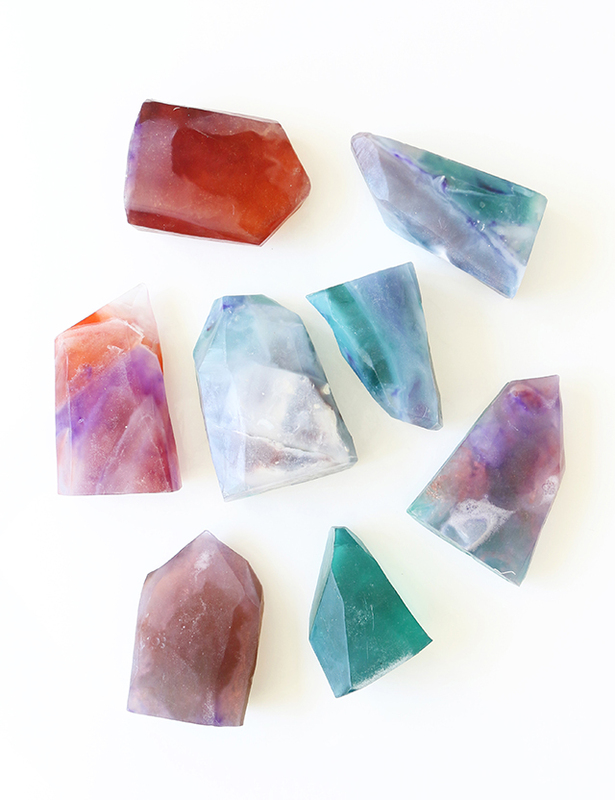 As you can see, I went with more translucent crystal-esque rocks instead of the milky opaque gemstone ones from the stores. 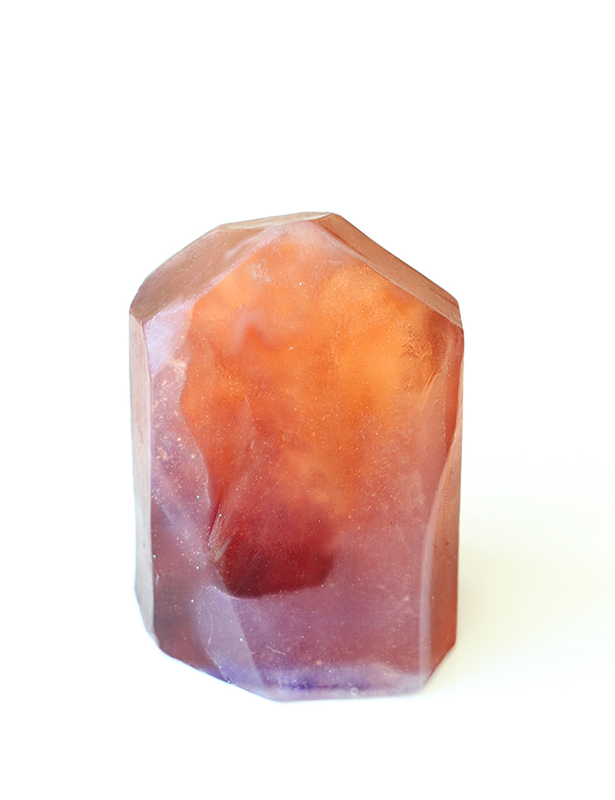 To achieve this, I used the “pour and mold” glycerin soap base in clear which was necessary to get the look I was going for. 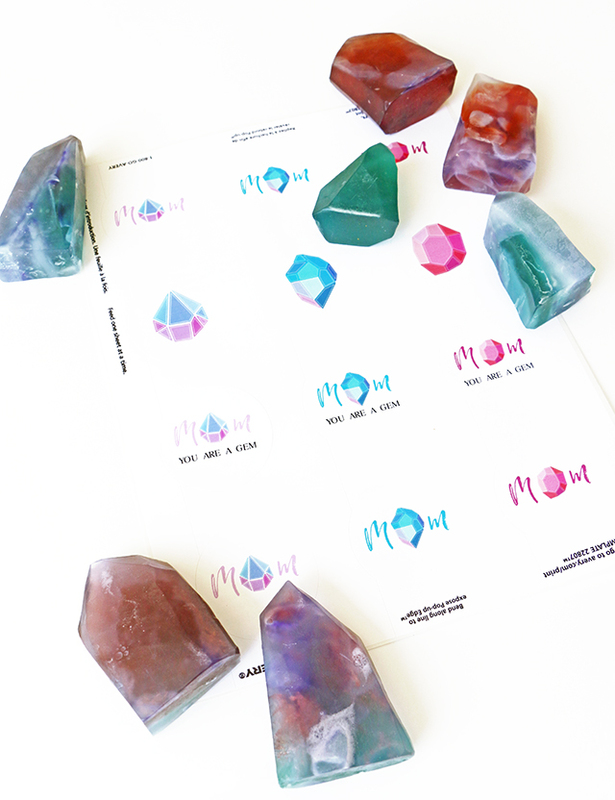 The entire process was an experiment, so I didn’t take too many photos of the process, but don’t let that stop you from trying this very fun project for yourself! 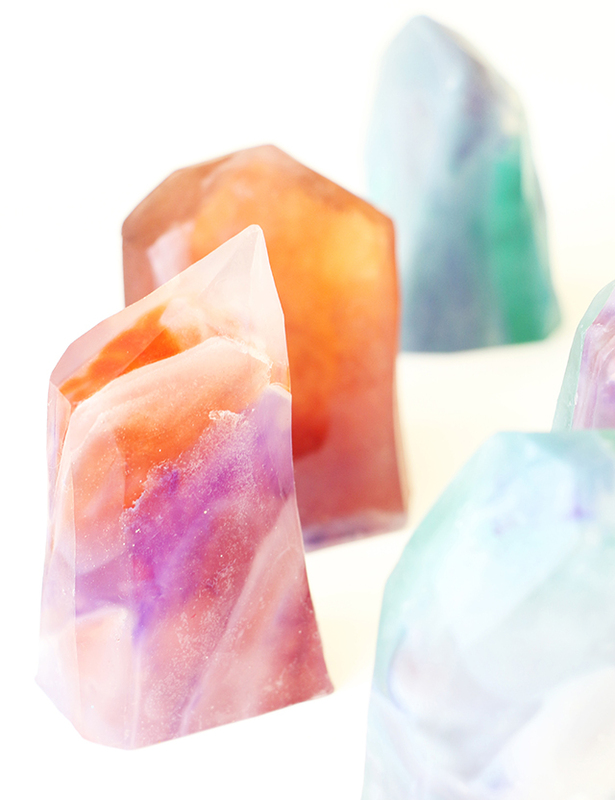 Material Notes: Okay, so apparently you can use food coloring instead of proper soap colorants (according to Martha). That surprises me – as food coloring often stains my hands – but perhaps it gets neutralized in the glycerin. Anywho, I just wanted to call that out if you’re on a budget and have some food coloring already in stock on your shelves. Another optional material is that silicone mold. 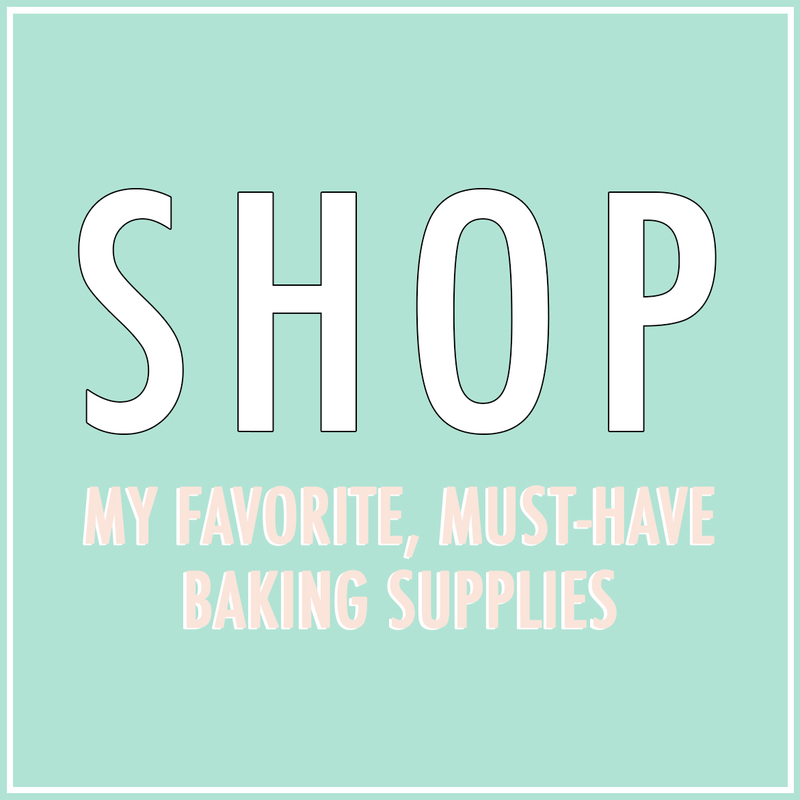 I found it fairly useful to have one, but you can also use old juice or milk cartons, some non-stick pans, and pretty much any type of silicone mold or tray as well. 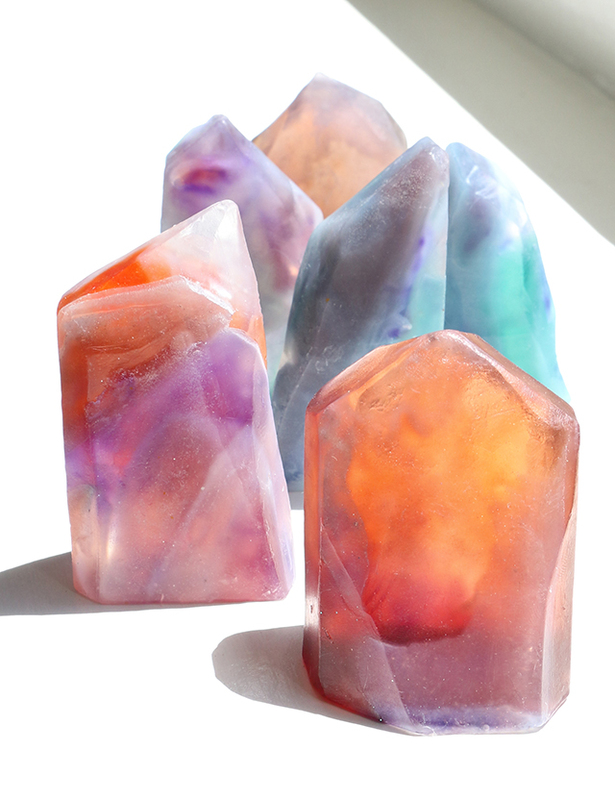 Note: Repeat Steps #1-3 a handful of times until you have a variety of colored soaps molded. Step #1: Chop a handful of the glycerin base cubes into small pieces. In a microwave-safe container heat the glycerin pieces in the microwave on high, stirring every 15-seconds until it’s completely melted (this should only take around 45 seconds total). If you don’t have a microwave, just melt in a pot on lo-med heat. Step #2: Add 1-2 drops of the liquid coloring into the bowl and gently swirl the container with your hands to mix the color into the glycerin. 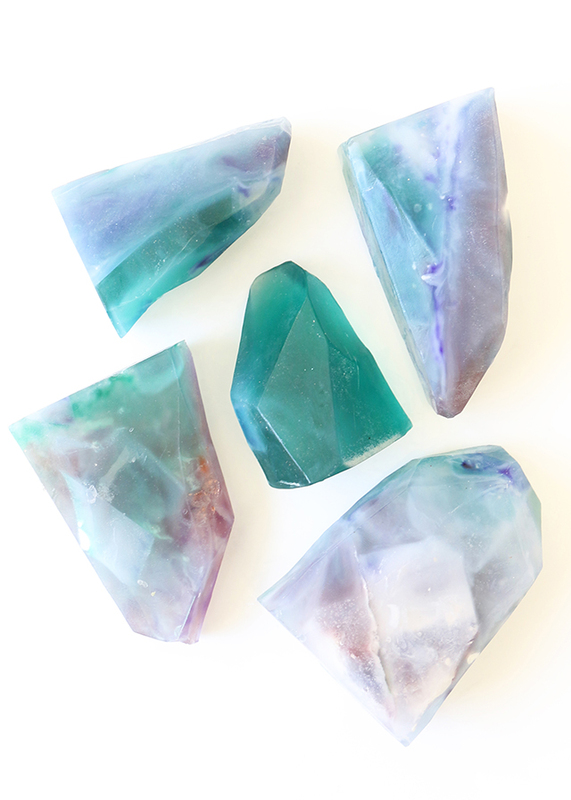 For some of my molds, I fully mixed in the color, and for others I just slightly let immerse with the glycerin (which resembled that gradient you can often see in crystals as they go from clear to colored). Step #3: Pour the melted glycerin into your mold and let it set. Since the soap can take a few hours to set at room temperature, I decided to speed up the process by sticking my mold in the freezer for about 20-30 minutes each time. Repeat Steps #1-3 for each color of soap you’d like to have present in your soap stones. 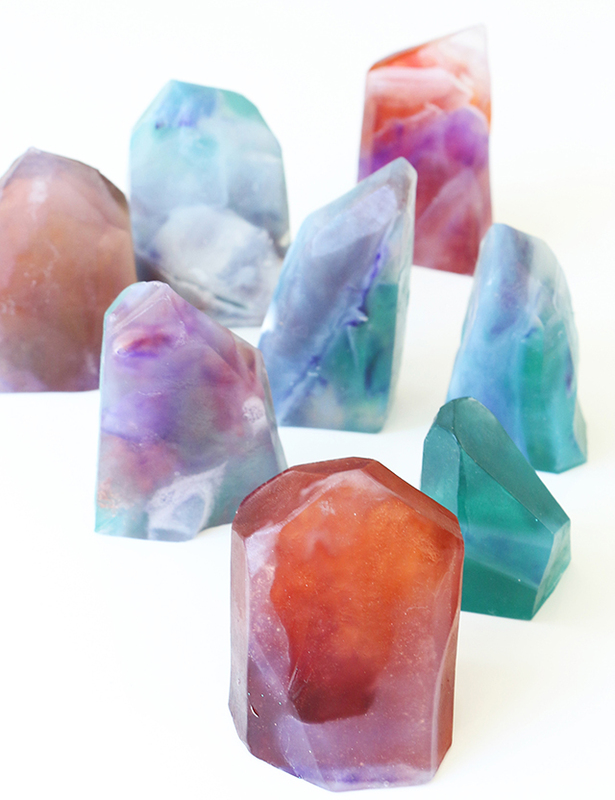 Once you have at least 4 or 5 colored molds to choose from, you’re ready to continue on. Step #4: Use a knife to cut chunks out of each of your colored molds. Vary the angles of your cuts and the size of the pieces. Group similar colors together and layer them in the mold. Repeat Step #1 and pour the clear melted glycerin into the mold. 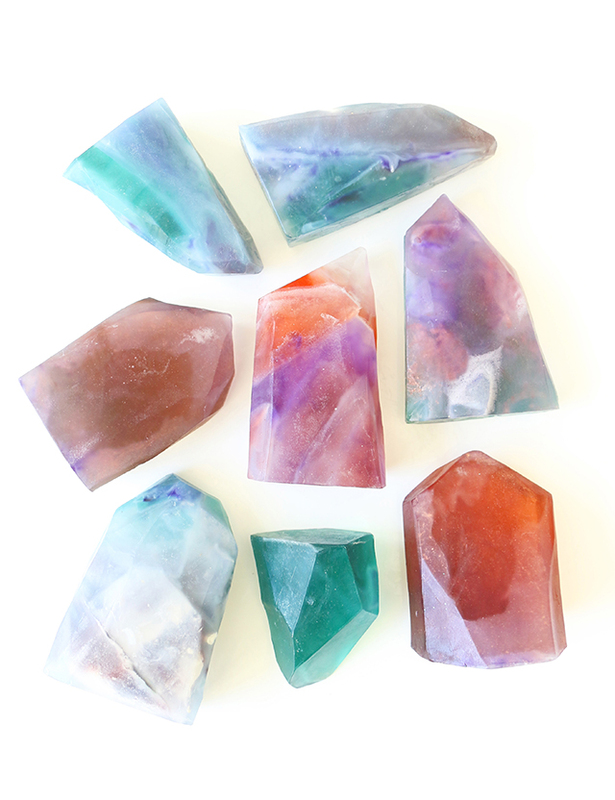 If you want to add any color, feel free to do so, but don’t use too much as you already have the colored pieces present and it can get too dark, which may hide some of the pretty color details inside each soap stone. And honestly, please don’t worry about these directions not being too specific. It was a lot of fun experimenting with the possibilities of the glycerin soap and thankfully you really can’t screw it up. Step #5: You’ll need to let your final mold (aka the giant brick) set for a while. I’d recommend that you allow at least an hour in the freezer or overnight at room temp.Regardless of which method you choose, make sure to touch the soap to confirm that it is nice and firm before removing it from the mold. 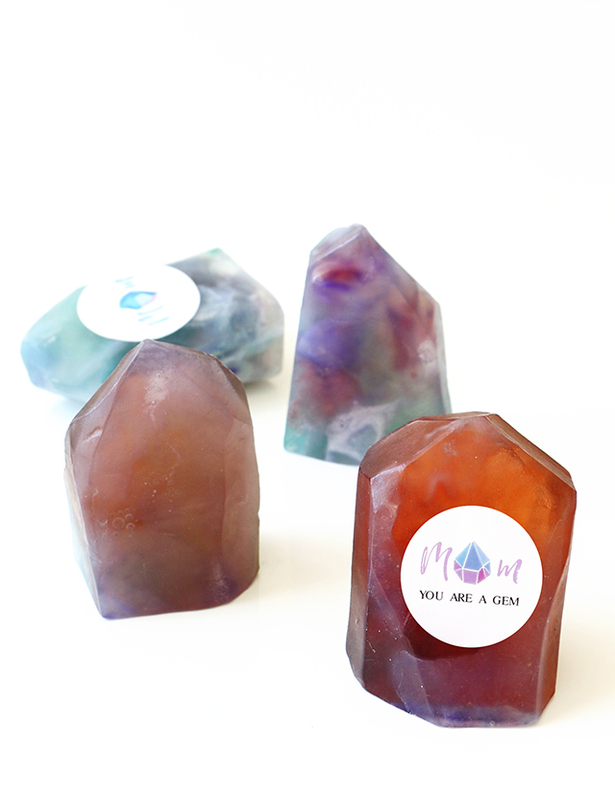 While you’re waiting for your soap to mold, go ahead and make your labels. If you’re happy with the ones that I designed (I mean, how could you not be?!? ), you can download the PDF version HERE and just print them using the Avery #22807 labels. If you’d like to customize my design a bit more (change the colors, resize, etc.) OR if you want to make your own design, download the Avery version HERE! To open the .avery file provided go to avery.com/print, open the saved file (select “Open a Saved Project from: Your Computer”), and the design will automatically open in Avery Design & Print Online. You’ll be able to customize and personalize the design to make it best for you – it really couldn’t be any easier! 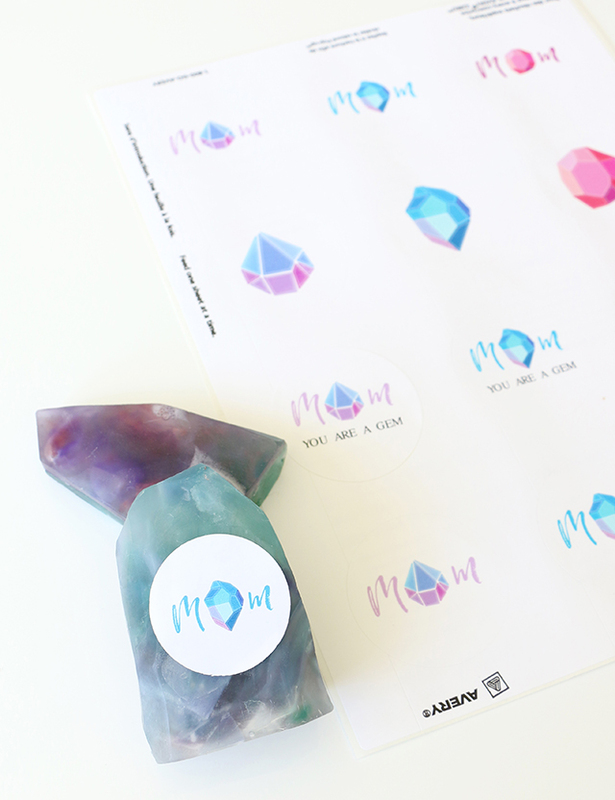 Sidenote: You’ll notice I also included the gemstones on their own in the printable, so you could just use those and add a “To/From” line using the Avery print tools to make these gift tags work for gem-esque gifts all year round! 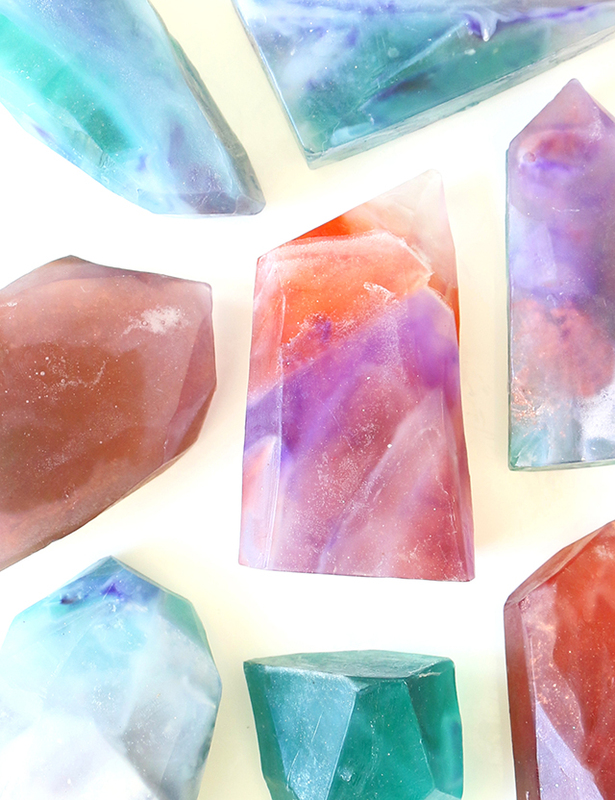 Step #6: Once your brick of cool-looking soap is nice and hard, start chopping it into gem shapes. I went with a rectangular bar soap-sized shape first and the used my knife to add in the diagonal gem cuts. 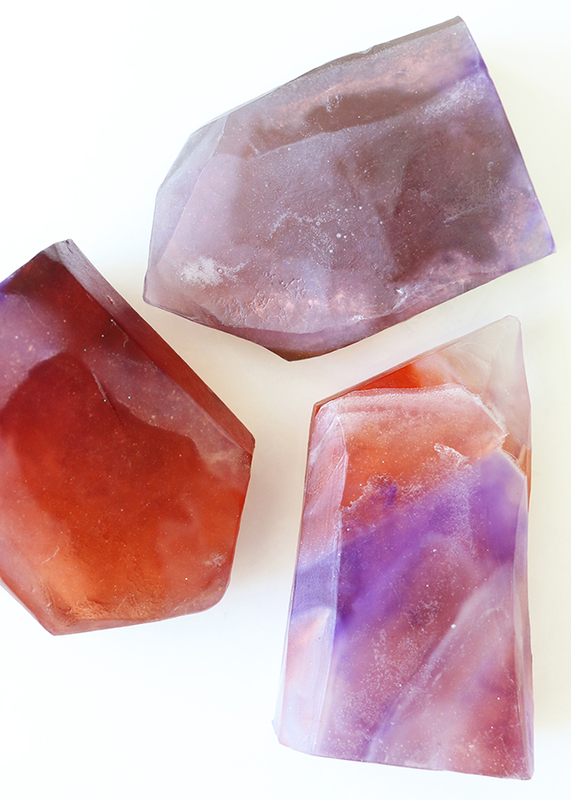 Every stone has it’s own shape, so you can’t mess this up either! If your knife isn’t doing the trick, you can also use a vegetable peeler to get accurate cuts. What I really love about this project is that you literally don’t waste anything. 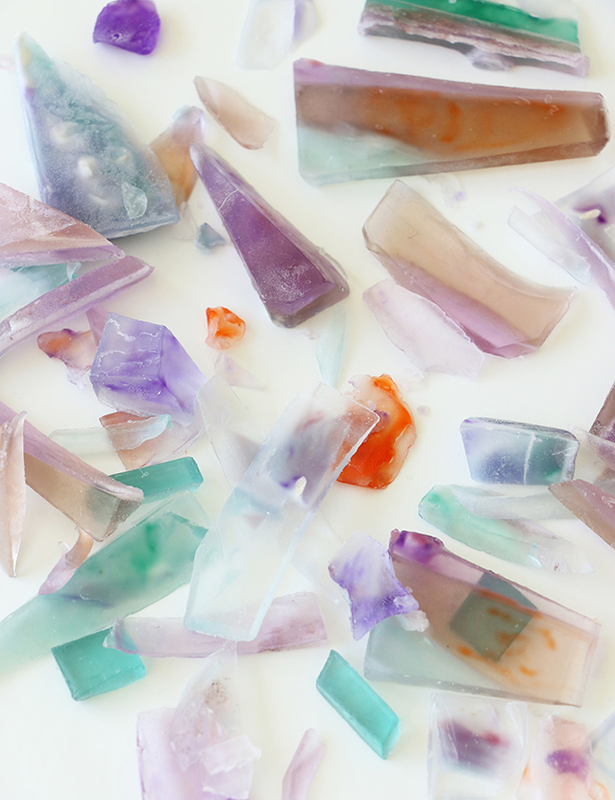 Any scraps can get re-used into other soaps either as whole chunks or they can be melted down again. This really is a fun project – hope you guys all enjoy the experimental portion of it as well!